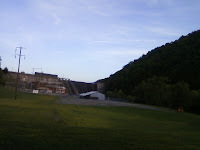 These photos are taken at Ocoee Dam Number 1 and Sugarloaf Mountain Park on the Ocoee River. I am told that this is the first hydroelectric dam in the region. Although the Ocoee Number 1 Dam isn't the largest in Tennessee, Sugarloaf Park makes it more interesting. The park is named for Sugarloaf Mountain. It towers nearby in the right of the photo. The dam and boat launch are on the left. The park doesn't show much in this picture. Sugarloaf Mountain Park has an unusual feature that sets it apart from all others. If you haven't heard, the Ocoee River was the site of the 1996 Olympics, and this park has a model of the portion of the river that was used to plan and prepare for the competition. The model was 300 x 30 ft model was constructed by TVA in 1993. A paved walking trail circles around the model and takes you past an abandoned railroad trestle at the foot of Sugarloaf Mountain. The trail ends at the parking by the boat launch. From there you can walk across the parking lot to your car. It's an easy walk, the path is fully paved and on fairly level ground. A stop at the Ocoee Whitewater Center helped complete this fun day trip. The visitor center wasn't open while we were there but we didn't feel cheated. Next to the center is a 2.4 mile section of Old Copper Road and a pedestrian suspension bridge over the river. The drive is an an easy and scenic day trip from Knoxville or Chattanooga.